In many ways, the name says it all: BMW 760Li. Straight away, you know what to expect in this vehicle. The BMW 760Li is bound to be luxurious, powerful and very, very desirable. It should look opulent and expensive, but without being showy, ostentatious or vulgar in any way. The ultra-luxurious BMW 760Li has many hidden surprises within the conservative and slightly sporty exterior. So does the new BMW 760Li come up to scratch? BMW has been touting this latest addition to the prestigious 7-series line up as the flagship model for the German manufacturer, and it is pleasing to see that the car in the metal looks like living up to the hype – if one can use a word like “hype” in the same breath as “BMW 760Li”. The BMW 760Li made its presence known in Australia towards the end of 2009, so now we can all have a chance to have a look and take one for a test drive. 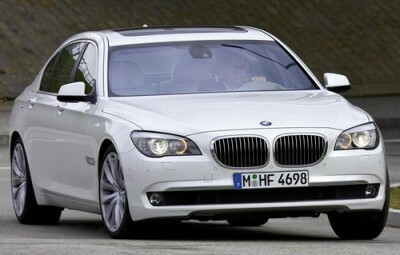 The BMW 760i was well worth the wait! Any 7-series worth its leather seats is bound to have some pretty serious performance, and the BMW 760Li comes up to scratch here. Under the bonnet – which is a touch younger-looking and sportier than this writer had expected it to be – throbs a very impressive V12 engine. Only the best Beemers get the V12, so you know straight away that the BMW 760Li is good. This 400 kW (5250 revs) 750Nm (from 1500 revs) unit is paired up with a transmission system that is something of a new development for BMW: an eight-speed automatic drivetrain. Add these to the renowned handling and precision of BMW and you get quite a drive, to say the very least. How fast can the BMW 760Li go? Well, the acceleration figures will give you an idea of what it’s capable of, even if those torque and power figures don’t. How does 4.6 seconds sound for the 0–100 kmh sprint? It sounds sweet – as sweet as the gurgling roar of that V12 motor. That V12 motor inside the BMW 760Li isn’t as thirsty as you think it might be. The BMW 760Li isn’t frugal – if frugality and fuel economy are your thing, then you’d be better off looking at a Mini, a smaller Peugeot or a small Saab – but this isn’t what the BMW 760Li is about. However, the BMW 760Li has been engineered for better fuel economy than its predecessor and can manage 13.6 l/100 km as its average consumption. This was so the BMW 760i could meet the EU5 emissions standards. BMW prides itself on its energy-saving “Dynamic Efficiency” technology, which includes everything from a stop/start button to the materials used in construction. There is plenty of room inside the long BMW 760Li (L stands for either long or limousine); buttons to adjust this and that (including some on the armrest in the rear seat – guess this BMW 760Li is meant to be chauffeur driven! ); positively palatial electrically adjustable leather seats with memory function and even a massage function in the rear; a first-rate audio system that’s MP3 compatible; front and rear security cameras: a night vision function; a Bluetooth-compatible phone system; oodles of airbags nearly everywhere you can think of putting them, like at the side front and back, curtain airbags, and front airbags for both front seats; bi-xenon headlights which have an auto-levelling system; and, of course, BMW’s iDrive system. To look at, the BMW 760Li has something of the older Jaguar about it, with a low, lean profile and impressive looking twin headlamps. The touches of chrome here and there are very tasteful – they’re cufflinks rather than bling. The distinctive kidney-grille is there, of course, looking as stylish as ever, but carefully re-proportioned to give the BMW 760Li the sportiness and elegance that was the overarching goal of the design team. All in all, the BMW 760Li is certainly engineering excellence and opulence at their finest. For any more information on the BMW 760Li, or for that matter any other new car, contact one of our friendly consultants on 1300 303 181. If you’d like some fleet discount pricing (yes even for private buyers! ), we can submit vehicle quote requests out to our national network of BMW dealers and come back with pricing within 24 hours. Private Fleet – car buying made easy!